Planning permission has been granted by Dublin City Council. The restored Clerys building as envisaged by the architects. 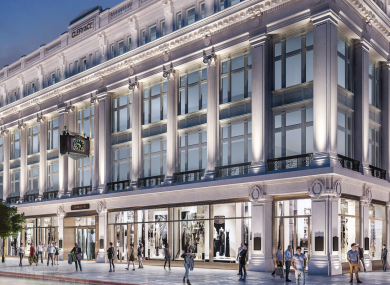 THE CLERYS CLOCK will survive the redevelopment of the landmark O’Connell Street building which closed last year – as architects plan to return the site to its former glory. Dublin City Council has granted planning permission to the project which will see an extra rooftop level added to the main building and a hotel, shops, office space and restaurants opened on the site. Other conservation and restoration measures promised by the Natrium consortium include cleaning up the Portland stone facade of the building, reinstatement of existing windows and the restoration of the feature double staircase. When Natrium bought Clerys in June of last year, they immediately closed it down in a shock move that saw the loss of over 450 jobs. The plans published on Dublin City Council’s website are keen to reference the ambitious past of the building. When Clerys was first built, there was a double-space height on the ground floor – “an element of grandeur” according to architects Henry J Lyons. The new plans propose to insert a glass atrium in the new rooftop level which will deliver light right down to the ground floor. A photograph of Clerys ground floor in the 1930s shows the old double-height space that once opened up the shopping floor. The basement and first floors of the main building will be dedicated to retail; the ground floor to an entrance and lobby; the second, third and fourth to office space. The new top area – complete with external viewing deck over O’Connell Street and a sunken planted area to the rear – is described in the architects’ plans as a “rooftop destination”. The Clerys Tea Rooms will be “reinstated” and accessible via a lift and the feature staircase which led into the main ground shopping floor before the department store’s closure. The Clerys site isn’t just the area covered by the shopping floors with which we were all familiar. It also stretches back to houses on 94-95 Marlborough Street and to a large warehouse plot – the plan for these is to create a hotel which will have a restaurant/café/bar at its entrance on Earl Place and courtyards and bridge links bringing extra bedrooms and main hotel together. The houses on Marlborough Street are historically significant – they were built as grand family homes around 1760 and the original chimneys and fireplaces, and as many original other architectural features that remain, will be retained in their refurb as accommodation in the new hotel facility. The entrance to Earl Place aims to rejuvenate that laneway, pedestrianising it with patrons at the tea rooms on the first floor able to look out through slide-back windows across the entire floor. O’Connell Street as it stands today has lost its status in all but name as a European capital street; it does not compare favourably with our continental neighbours and the story of this street and of the buildings on this street must now become one of regeneration, rebirth and renaissance. The building affectionately known to generations of Dubliners as Clerys is located on the site of McSwiney Delaney & Company’s ‘Palatial Mart’, a Victorian department store built in 1853 to coincide with the Dublin International Exhibition. The building was taken over by Michael Clery from Bulgaden, Co Limerick with a consortium of owners (hence the Clerys & Co.) and reopened in 1884 after a year’s hiatus. Clerys did not avoid the devastation wreaked on then-Sackville Street during the 1916 Rising and the building was entirely destroyed by fire. The current building was opened in August 1922. Its chequered history continued when it went into bankruptcy in 1940, passing eventually to the Guiney family who owned it until 2004. It was placed into receivership in 2012, and was taken over by the US investment firm Gordon Brothers. They in turn sold it for €29 million to the Natrium consortium headed up by Deirdre Foley, John Skelly and Ronan Daly. You can read more about that consortium here. The Irish Times has reported that Natrium has said the new development will eventually employ 2,500 people. When Clerys closed suddenly last year, workers held emergency meetings with Siptu and there was heavy criticism of the manner in which employees and concession owners were informed of their fate. One year on, some former Clerys workers told TheJournal.ie that they had won entitlements following a battle backed by Siptu but felt there was a review needed of legislation protecting employee interests “when assets are separated from an operating company”. There were 43 letters of objection to the plans submitted to Dublin City Council, among them complaints from former workers, as well as councillors Ciarán Cuff of the Green Party and independent Nial Ring. Email “Clerys building to come to life with extra floor and glass atrium”. Feedback on “Clerys building to come to life with extra floor and glass atrium”.